Have you ever raised funds for your church, another organization, or a mission trip? Maybe you felt uncomfortable about asking people to donate money. It's time to change the way you view this important task. 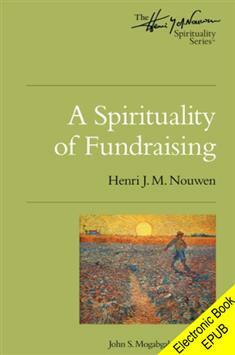 "Fundraising is, first and foremost, a ministry," renowned author and teacher Henri Nouwen writes in the introduction. "It's a way of announcing our vision and inviting other people into our mission." Nouwen approaches fundraising from a position of strength rather than weakness, seeing it as spiritual work. "Fundraising is precisely the opposite of begging," he points out. Nouwen's insights will shift your thinking about fundraising. You'll never feel as though you are begging for money but will instead view your work as true ministry. A must-read for leaders in churches, nonprofits, ministries, and businesses!